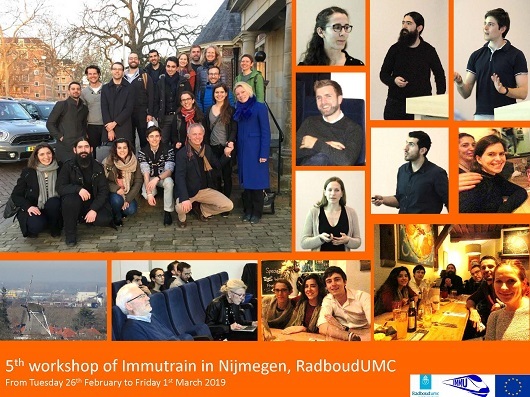 The fifth workshop of the European Training Network Immutrain has taken place from February 26th to March 1st, 2019 in Nijmegen. The PhD students presented their projects in closed session and benefited from the feedbacks of the scientists of the network for one and half day. The training focused then on soft skills about diversity, science communication and work/life balance. 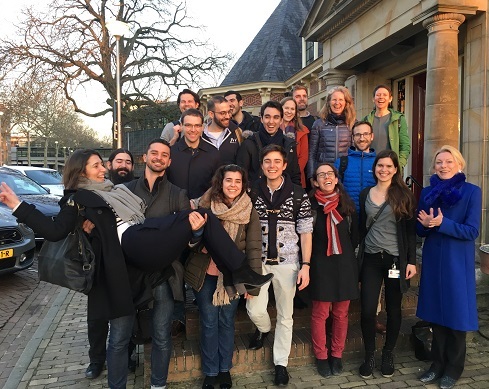 On the first day during dinner, at the beautiful ‘Huize Heyendael’ in the Radboudumc University campus, the ESRs had the opportunity to benefit from each of the PIs personal experience on managing a successful scientific career with personal life. After dinner followed an interesting and stimulating presentation by Professor Peter Friedl, showing real-time imaging of tumour cell migration and cell-mediated cytotoxicity, which sparked everyone’s interest and started an exciting discussion afterwards. On the second day, the ESRs had an insightful workshop on Diversity in Science, held by Soley Tomasdottir. During this workshop the discussion focused on ways of identifying and eliminating personal bias to be more inclusive in an international scientific working environment. On the third day, Marcek Wortel, the public information officer of the Radboudumc University, held an inspiring workshop on how to communicate science to the general public. The topic included different techniques of captivating an audience and convey complex and specific scientific information in a widely understandable manner, while avoiding misinterpretations. The ESRs even had the opportunity to practice their newfound storytelling skills in front of a panel. On the fourth and final day, the ESRs had the insightful workshop on work/life balance held by Sheila van de Sande. The workshop focused on awareness around personal and working habits as well as effective task and energy management to achieve a more productive, less stressful and more fulfilling everyday working experience... like here.